Aconite Monkshood, Aconitum napellus. is major “drug” of antiquity. The entire plant, including the herb, root and seed are extremely poisonous when taken in sufficient dose. A very attractive plant with hood-shaped flowers. Used internally as a homeopathic remedy or externally as a liniment to relieve nerve and muscle pain. Any external use must be carefully moderated. Not a herb for self medication. aka: Wolfsbane. Monkshood is indigenous to the Himalayan foothills and prefers moist, loamy soils in a protected, semi-shaded position. Frost resistant but drought tender. 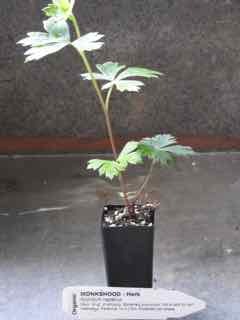 A hardy herbaceous perennial plant, growing to a height of 1m x 0.5m. Monkshood may become dormant over summer in some climates. Be the first to review “Monkshood, plant” Click here to cancel reply.